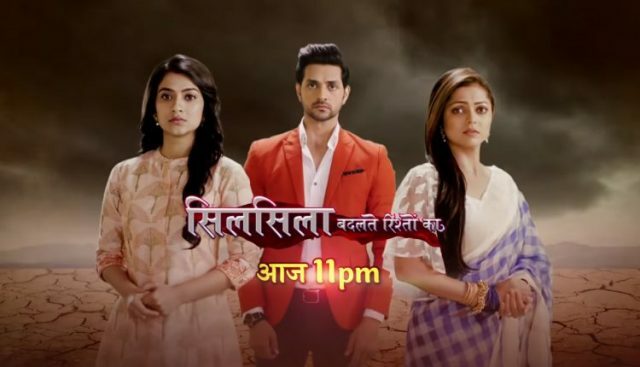 In the latest episode of Silsila Badalte Rishton Ka 14th November 2018, Kunal returns to the family. The latest update begins with Pari runs towards Mishti and she hugs her. Mauli and Ishaan both were very happy to see them. Kunal stood in the parking. When Mauli saw her she gave a hug and smiles to saw on her face. Mauli greets to Pari and she leaves to receive her family. Kunal walks towards the apartment while Maui was coming towards the parking. They soon confront each other. To saw his Mauli was smiling in vanishes way. Pari and Mishti both come running there very fastly. Pari introduces Mauli to her Buddy and asks to her that if she found him handsome? Mishti said that he is her popsy. To knew this she gets a little sad. But she thinks that today is Diwali so she cannot hurt anyone. Mishit introduce Kunal to her mother. Ishaan comes there and he was complaining that who would introduce him? Mishit said to him that he is my popsy. Mauli joins hands to say happy Diwali to Kunal. To say all this Kunal gets shocked. Kunal gave a small gift box to Ishaan. He asks a question to Kunal about his wife. Mauli scolds to Mishti for her muddy hands and takes to her inside to wash there dirty hand. Misht takes to Pari along with her and she requested Mauli to let them play for some more time. To saw there in the innocent face she said ok to play some more time. Mamma spots that Kunal is still standing where he had been. Ishaan takes the kids to light some crackers. They all enjoyed too much. Mamma walks to Kunal, her eyes were filled with tears. Precap: Mauli shows that extra affection to Ishaan on their dinner with Kunal. He eyes at Mauli.